After prolonged debate, Congress recently passed a $1 billion bill including funds to combat a rampant epidemic of opioid and heroin addiction in practically every region of the country. The lawmakers’ action couldn’t have been more timely. For the first time last year, deaths from heroin overdoses rose from 10,574 in 2014 to 12,990 in 2015 – an increase of 23 percent. More shocking, heroin deaths narrowly surpassed deaths from gun violence in the U.S., a tragic grace note to newly released federal data showing an historic surge in tragic fatalities from the widespread abuse of prescription drug painkillers and heroin. As recently as 2007, gun-related homicides outnumbered heroin-related deaths by more than 5 to 1, as The Washington Post noted. The number of overdose deaths involving opioids increased from 28,647 in 2014 to 33,091 in 2015, an 8.9 percent rise, according to the National Center for Health Statistics, an arm of the Centers for Disease Control and Prevention. Heroin addiction historically was a problem largely confined to black urban areas of the country and often was treated more as a criminal justice matter than a public health problem. But more recently, the problem has swept suburban and rural white communities prompting widespread concern during the presidential campaign and spurring legislative action to come to grips with the crisis. Heroin is an opioid derived from poppy plants largely grown in war-torn Afghanistan. It has become so prevalent in the international black market that its street price has plummeted, making it an attractive drug of choice for addicts. For the first time in nearly two decades, there were more deaths in the U.S. from heroin abuse last year than from traditional prescription drug painkillers, such as the highly addictive and potentially lethal hydrocodone and oxycodone. “We need to drastically improve both the treatment of pain and the treatment of opioid use disorders and increase the use of naloxone to reverse opioid overdose,” Frieden added. “We must also work collaboratively with our public safety partners to further reduce access to illicit opioids." The alarming surge in the number of opioid and heroin-related deaths comes at a time when Americans appear to be losing ground in maintaining good health and extending their life expectancy – despite spending more than $3.2 trillion a year on health care, or $9,900 per person. 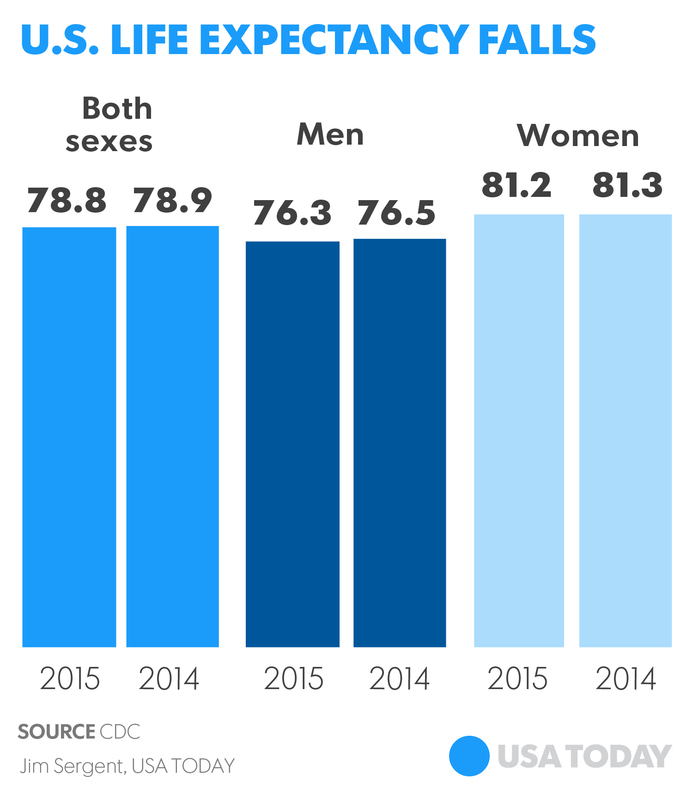 U.S. life expectancy declined in 2015 for the first time since 1993, according to other CDC data released this week. By way of comparison, the average life expectancy of Americans was just over 68 years back in the 1950s but gradually inched up over the next half century. An American born in 2014 could expect to live 78 years and 10 months, according to the government’s actuarial projections. But the average projected longevity rate slipped last year by about a month, according to preliminary data. The decline "could be a blip, but even if it’s flat, we have a real problem," Jonathan Skinner, a professor at the Dartmouth Institute for Health Policy & Clinical Practice, told USA Today. The CDC report was based on death certificates issued in 2015. There were more than 2.7 million deaths last year or about 86,000 more than the previous year. Much of the increase was due to the growth and the aging of the population. While the report provided few clues to the cause of this unexpected shift in the nation’s mortality rate, health care experts have cited a number of causes – both behavioral and genetic – that contribute to the problem. The surge in the abuse of drugs and alcohol are certainly a major problem, researchers say, as is obesity that contributes to heart disease, diabetes, strokes and other problems. Heart disease is the leading cause of deaths in the country, according to the CDC, and contributed to 614,348 deaths last year – just ahead of cancer with 591,699 deaths. Chronic lower respiratory illnesses rank third in overall deaths with 147,101, followed by deaths from accidental injuries (136,053), strokes (133,103), Alzheimer’s disease (93,541), the flu and pneumonia (55,227), and suicides (42,773). Last year, two Nobel-Prize winning Princeton economists, Anne Case and Angus Deaton, published groundbreaking findings that the death rate was rising most notably among middle-aged whites while it was either holding steady or declining among all other racial and ethnic groups in the U.S. White Americans were also faring far worse than middle-aged whites in other parts of the world. The study was based on analysis of CDC health and mortality data and other sources. The two economists concluded that the rising death rates among white Americans 45 to 54 years of age had less to do with major killers like heart disease and diabetes than by suicides and serious illness due to substance abuse, liver disease from too much drinking and overdoses of heroin and opioids. The mortality rate for whites with no more than a high school education increased by 134 deaths per 100,000 people from 1999 to 2014. “It is difficult to find modern settings with survival losses of this magnitude,” wrote two Dartmouth economists, Ellen Meara and Jonathan S. Skinner, in a commentary to the Deaton-Case analysis, which was published in Proceedings of the National Academy of Sciences.